Once you have clicked on the link, then you will be able to select and edit an existing template. 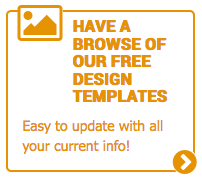 There are pre-formatted templates available for most industries. All you will need to do is select one to update and then save that under your account. You can come back to the design as often as you like and can do updates and alterations, be sure to save you changes as you go. 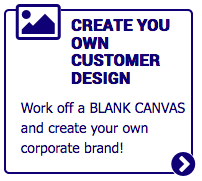 We have formatted files available so you are able to work off a blank canvas and create your own design using your existing logos and images. You are able to save your drafts under your account and re-edit them whenever required. This is a great option for small businesses, as you grow you can add, edit or delete from you own custom library. As you browse through the products and pricing you will notice the link at the bottom of the page to upload your print ready file. If you know your file is print ready, just follow the links to submit your order. We can also edit and alter your print ready files. If you have been supplied files from your designer but find you are unable to edit or open them, simply upload them and our pre-press department can make any alteration or edit you require. Please note PrePress charges do apply however we will always let you know before we commence any work.